Note: Most pixel based documents will require a separation art charge. Choose from our stock colors and avoid mixing charges. Need a special color mix? 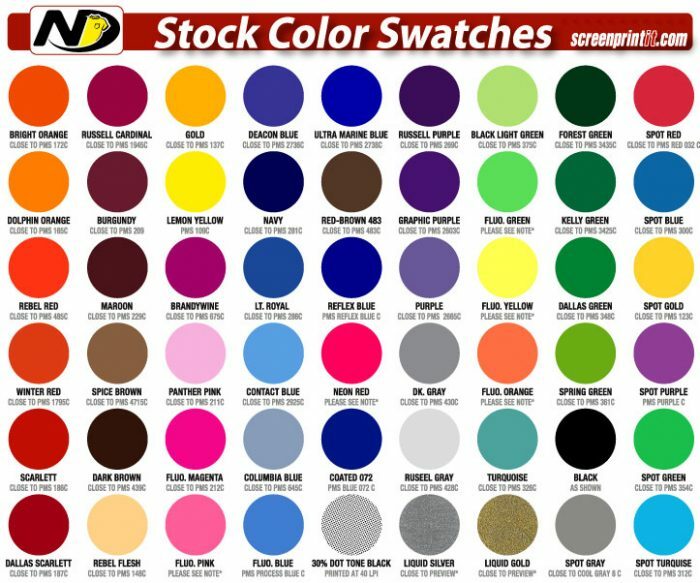 Use Pantone Matching System (PMS) coated ink swatches. Convert your color swatches to SPOT colors. Note: additional $12.50 per color charge. – Upload files to our FTP site. We recommend you ZIP (compress) your files when sending multiple or large documents. Full Front or Big Back (adult): 12” wide x 12” high (Max. imprint size 15” wide x 16” high).